With XJDeveloper 3.7 the user now has more control over how unfitted devices are suggested. 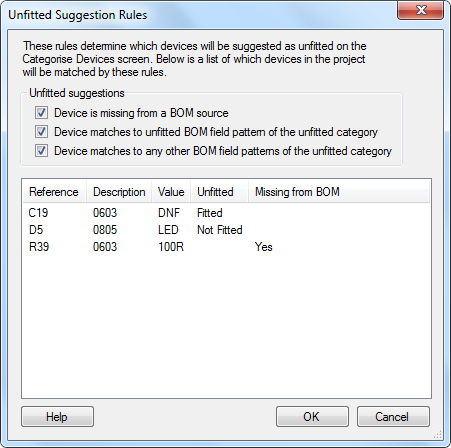 The Unfitted Rules Dialog allows for the specific suggestion methods to be enabled or disabled, allowing for more accurate unfitted device suggestions. The dialog is accessed by clicking the Unfitted Rules… button on the Boards screen. Device missing from a BOM source – This will suggest devices that are missing from any one of the BOM sources assigned to the device’s board. Disabling this is useful if your BOM source is incomplete. Device matches to unfitted BOM field pattern of the unfitted category – This suggests any device where the unfitted BOM entry matches the currently set regular expression (regex) pattern for that field on the suggested unfitted devices category. Device matches to any other BOM field patterns of the unfitted category – This suggests any devices where their BOM data matches to any of the other BOM field regex patterns currently assigned to the unfitted device category. By default the fields with patterns are Value and Description. Below this is a table that displays any devices from the current project which are suggested as unfitted using the currently selected rules. The table also displays device BOM data for all the fields with patterns set and indicates which, if any, are missing from a BOM source. The currently assigned patterns can be edited on the Categories page in the Developer Options Dialog.